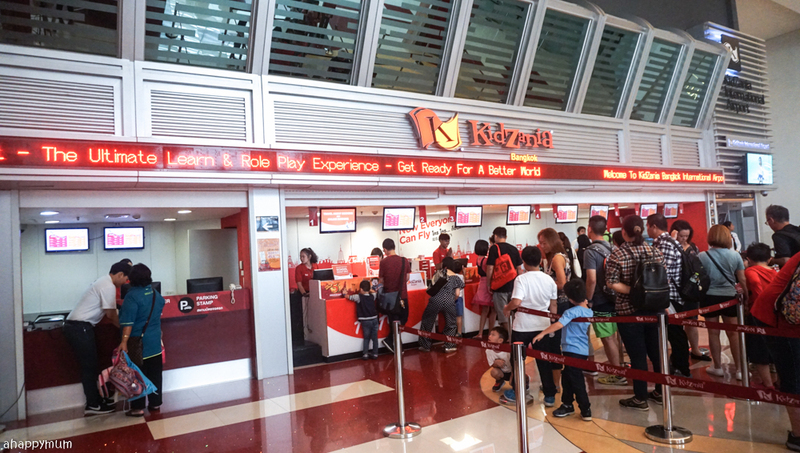 I guess most of us are familiar to the word KidZania since this indoor family entertainment theme park opened its doors on our shore - the first ever to be located on an island - in April 2016. 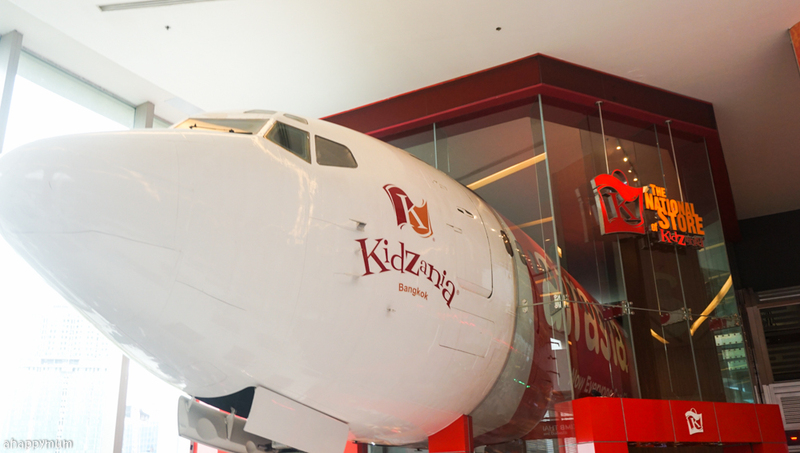 But did you know that KidZania, which started out in September 1999, now operates in 24 locations worldwide? 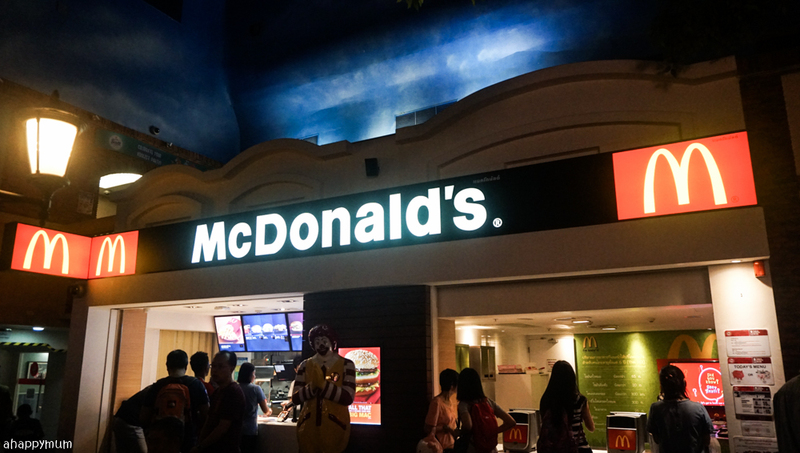 In addition, it is also scheduled to open in cities like Paris, Johannesburg, Toronto in the next few years and will also be making its entrance into the United States very soon too. 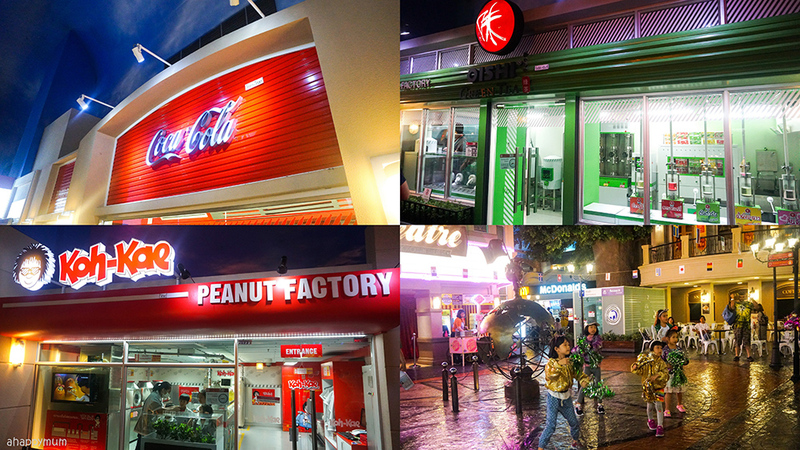 For those who don't know, KidZania is a hands-on, interactive indoor theme park which is a replica of a real city - complete with buildings, boutiques, theatres, hospitals, nurseries, restaurants, streets and transportation vehicles. 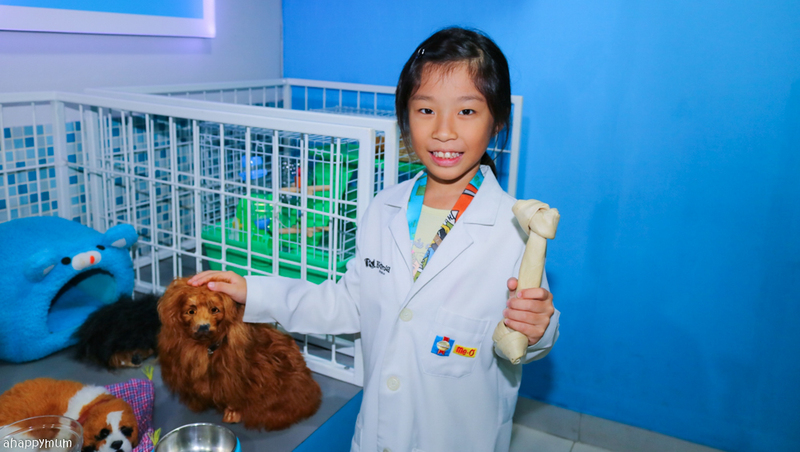 Children get to have fun and learn about different occupations through realistic role play under the guide of the Zupervisors. 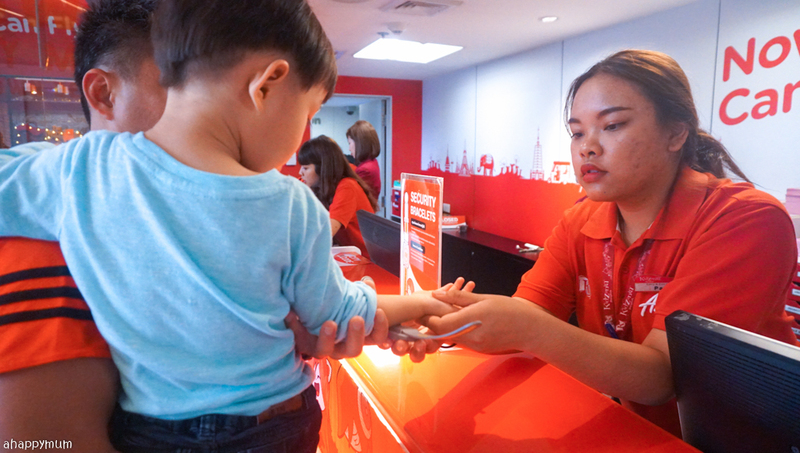 They also learn about money management by earning, or spending, KidZos - which is the currency in KidZania - while performing the activities. Yes, it's awesome that the kids get to understand how money is hard-earned and doesn't just fall down from the sky, and for them to be able to 'work' and earn their own salary, that makes it even better. 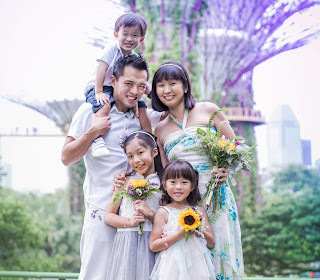 We've been to the one in Sentosa a couple of times and not surprisingly, the kids thoroughly enjoyed every moment of our visits. We would try to arrive early and be one of the last to leave just so as to fully utilise our day tickets and cover as many jobs as we could. 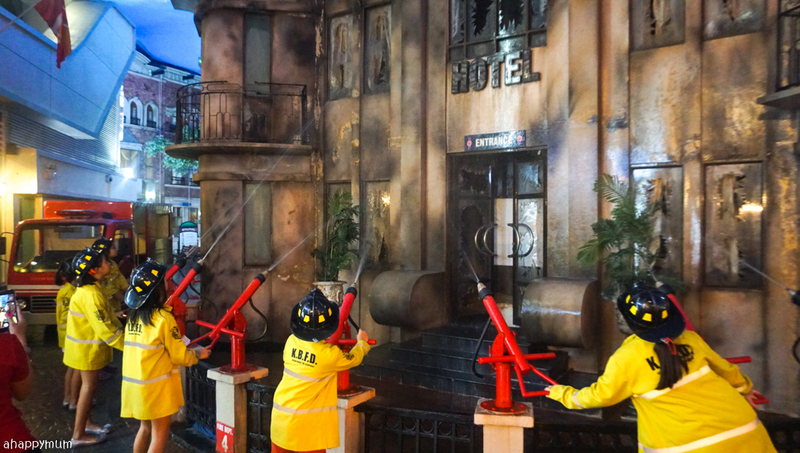 During our trip to Bangkok (read about our kid-friendly itinerary), we dedicated a day to visit KidZania Bangkok since this would be the first overseas branch we set foot on and we knew it would promise a full day of fun and learning opportunities. Indeed, the day went tremendously well and was one of the best ways to end off our family trip. 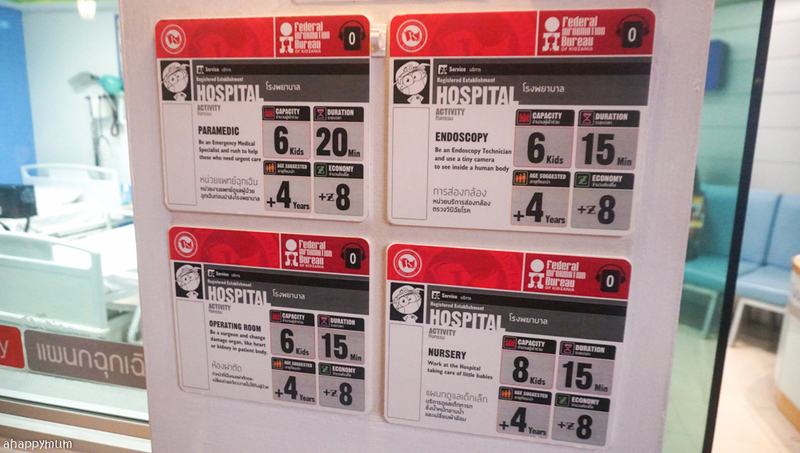 In this post, I will be sharing more about our experience, the activities we managed to try out and some of the highlights you can look forward to. 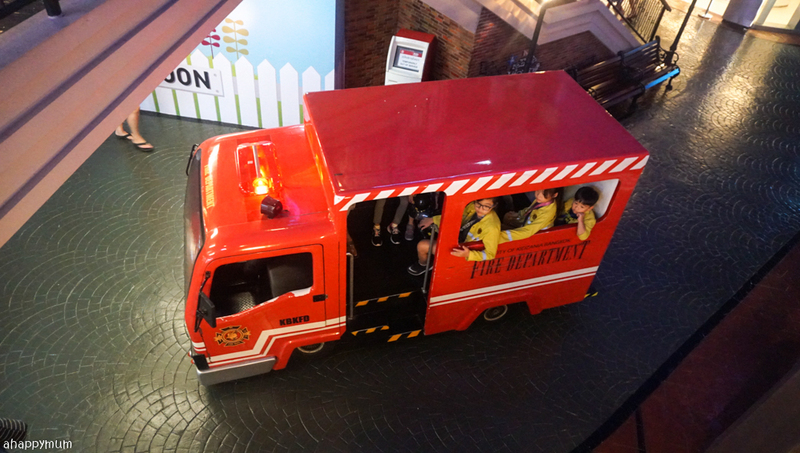 KidZania Bangkok is conveniently located on the 5th level of Siam Paragon, which also houses the popular Sea Life Bangkok Ocean World (read my review here). 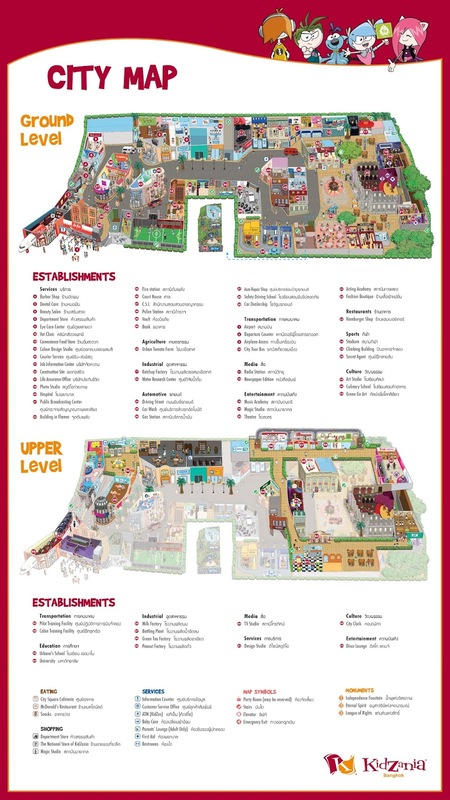 The shopping mall is easily accessible and you can take the BTS to Siam station which links you directly. Covering a floor size of over 10,000sqm with 80 role play activities in 65 establishments, you can be sure that you will not be able to finish exploring the place in a day. In fact, it might take you nearly a week to finish playing ALL of the activities. Take a look at the city map below and you will see what I mean. 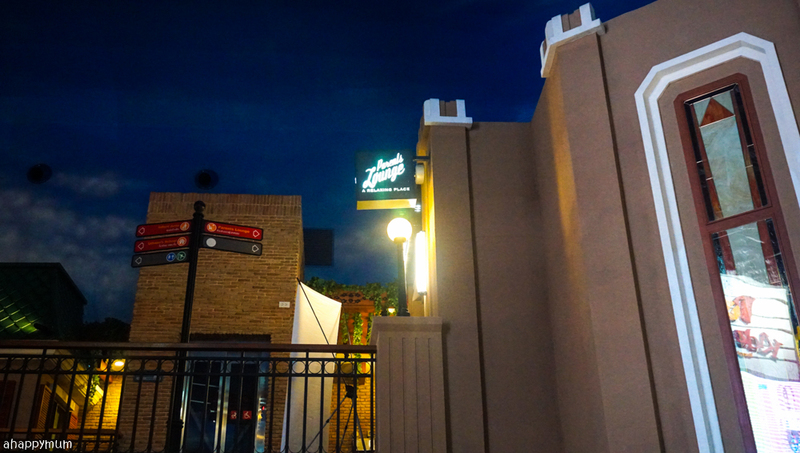 The park opens from 10:00am to 5:00pm from Mondays to Fridays and 10:30am to 8:30pm on Saturdays and Sundays. Despite the longer opening hours on weekends, we were told by the PR staff that it still gets very crowded on those days and you stand much better chances of covering more activities if you visit on weekdays. Do be sure to arrive early and be one of the first ones to enter because there are usually school excursions on weekdays too (they arrived about 10:30am when we were there but the majority of them left by 2pm). 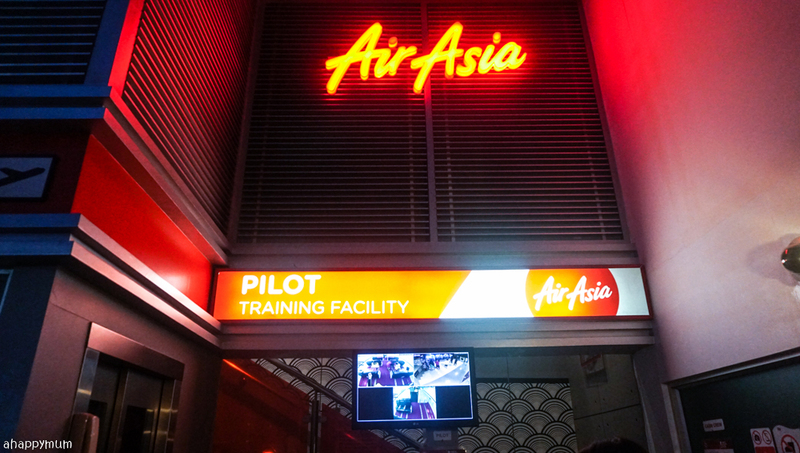 Same as how we were impressed by the fuselage of the Qatar Airways Boeing 737 in KidZania Singapore, we were greeted by that of an eye-catching 21-metre AirAsia Boeing 737 here in KidZania Bangkok. 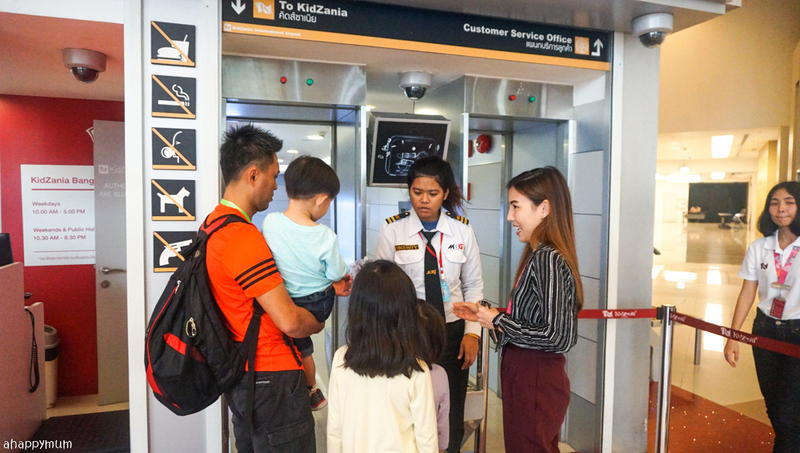 To enter the park, you would have to approach the airport ticketing counters and receive your 'boarding pass', along with a city map and cheque, before you can get on board. 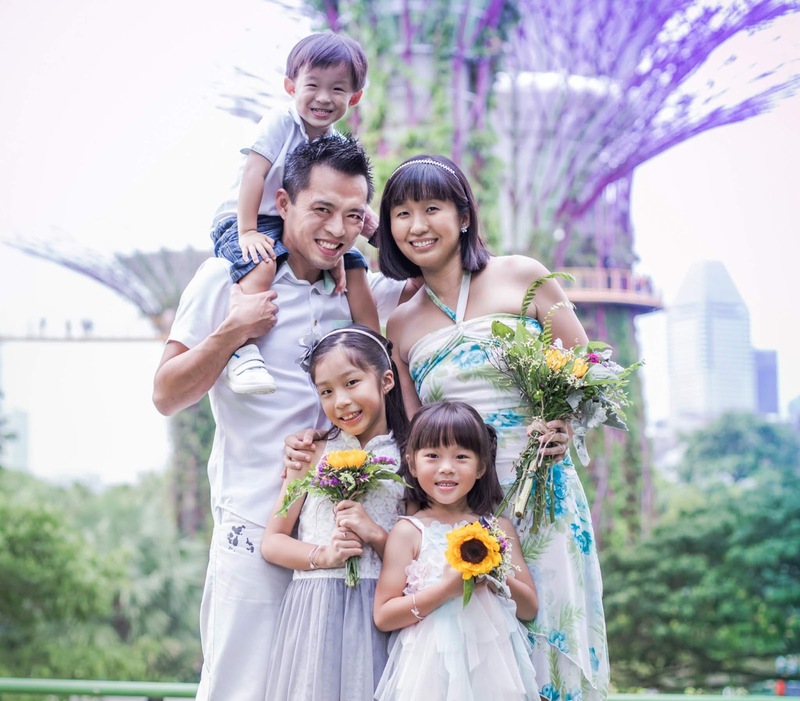 As a safety precaution, which is extremely crucial when young kids are involved, every guest will be tagged with a security RFID bracelet when you check in and without a special tool, you can't remove it. Besides allowing the staff to track and locate them throughout the city, the kids are only allowed to exit with the adults who checked in together with them. This helps to put parents' minds at ease, especially those whose kids are old enough to explore the park on their own. I can't say that my youngest loved wearing the bracelet but it made me feel assured knowing that he wouldn't be able to run off on his own. 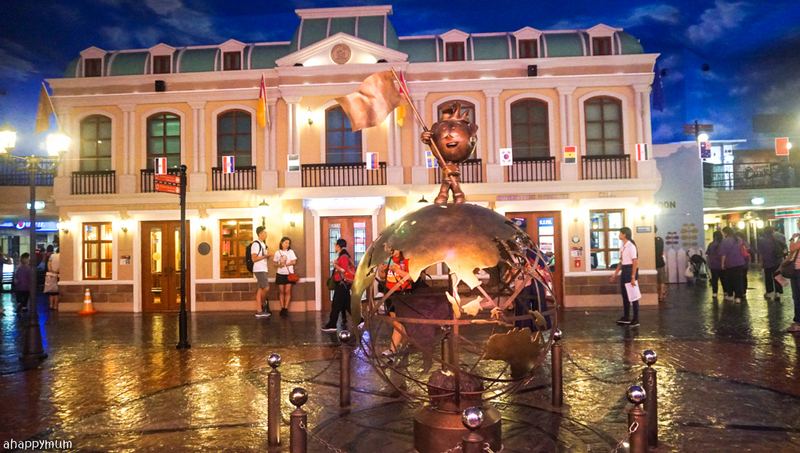 The interior of KidZania Bangkok, from the statues and buildings to the streets and signage, reminded us very much of the one we have here in Singapore. The brands and activities were, however, quite different so it made us feel excited to be able to try out new activities that we have never done before. Of course, there was some overlapping too for instance the cabin crew and pilot, firefighters and police but which kid could ever get tired of doing these popular, exciting jobs? 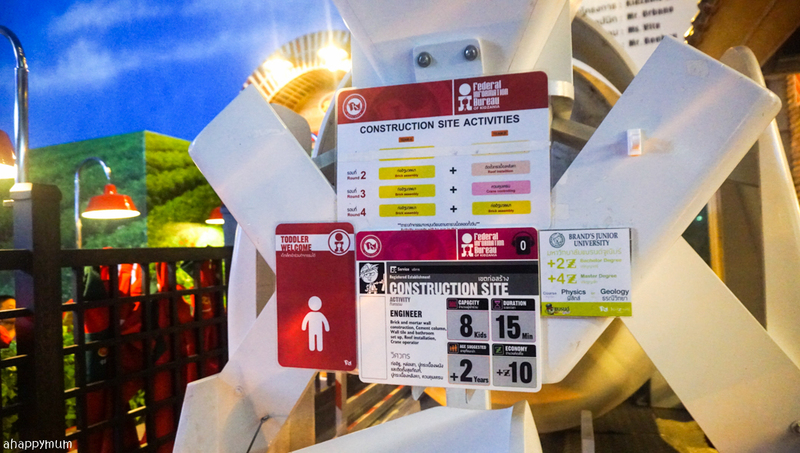 The instructions and job requirements are clearly labelled in English so it was easy for our kids to understand for instance the number of pax per session, duration, salary/cost and age requirement for every activity. 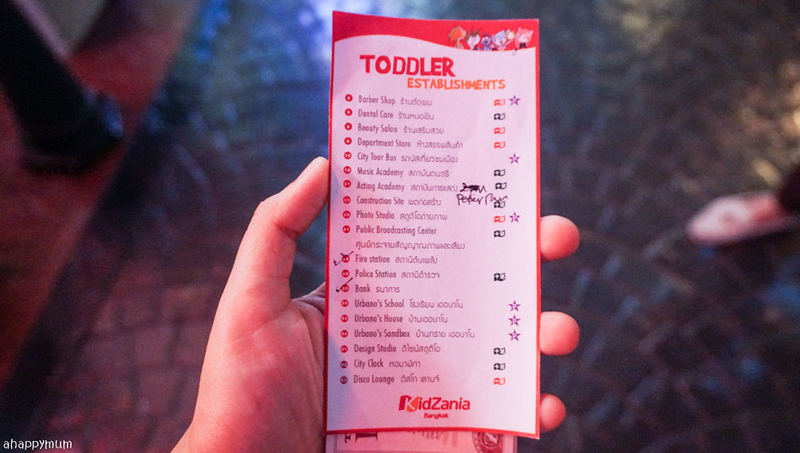 Talking about age requirement, I have to tell you that the one thing which thrilled me most about KidZania Bangkok was that I was given this whole list of establishments which are.... TODDLER FRIENDLY! Yes, instead of shutting out the two and three-year-olds and keeping them confined to merely a toddler play area, they will instead be able to join in a handful of activities at the different establishments as well. 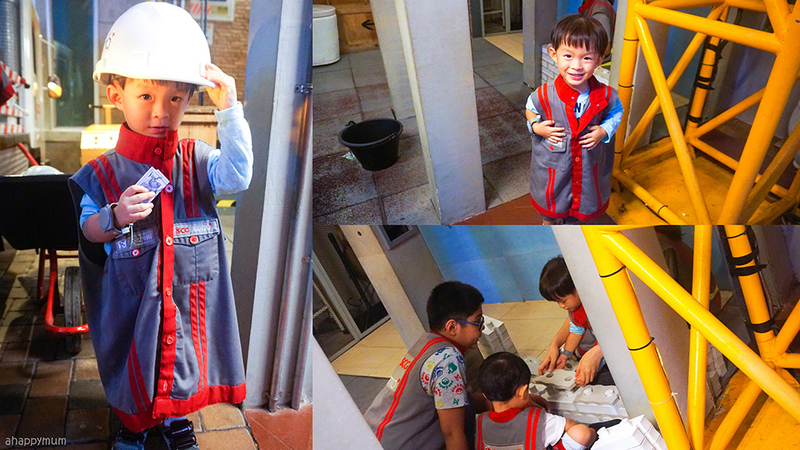 This was the first time my toddler was able to join in any real activity at KidZania and I was so excited for him too! 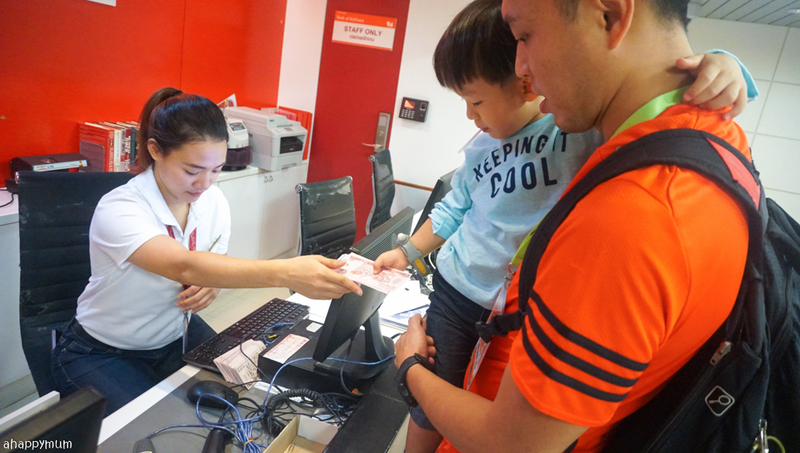 Before we embarked on our activities, the first thing we had to do was to visit the bank and cash out our cheque! Yes, once you've done that, you're all set to go! I will be sharing with you about the activities we managed to try out in a day so you can have a good sense of what the place offers. 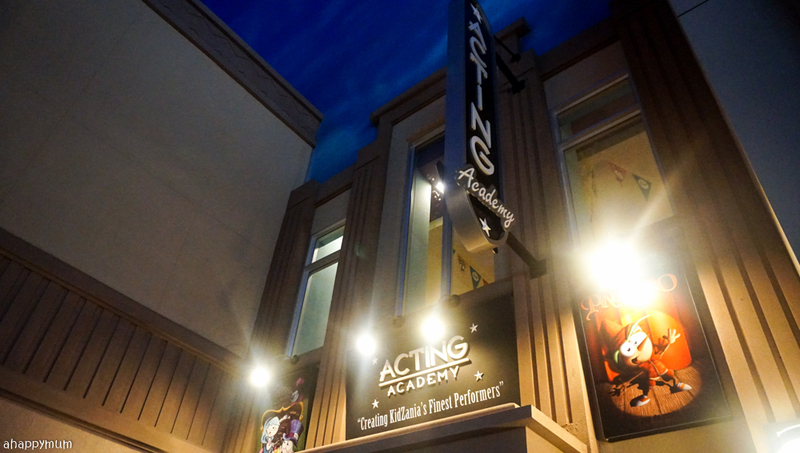 The Acting Academy is a good way for kids to learn about speech and drama and at the same time build up their confidence. 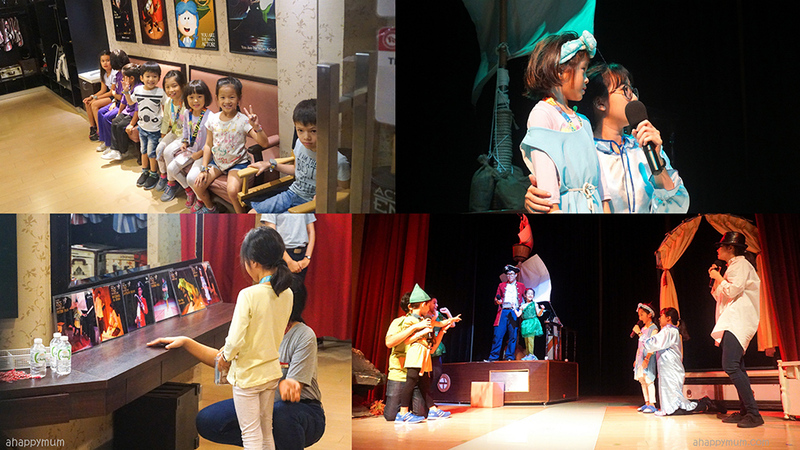 Kids get to choose the character they wish to portray in the sketch and afterwards, they will attend an one-hour long rehearsal before they finally hit the stage! Yes, they will perform in front of a live audience and all parents and park guests are welcome to watch it in the theatre. 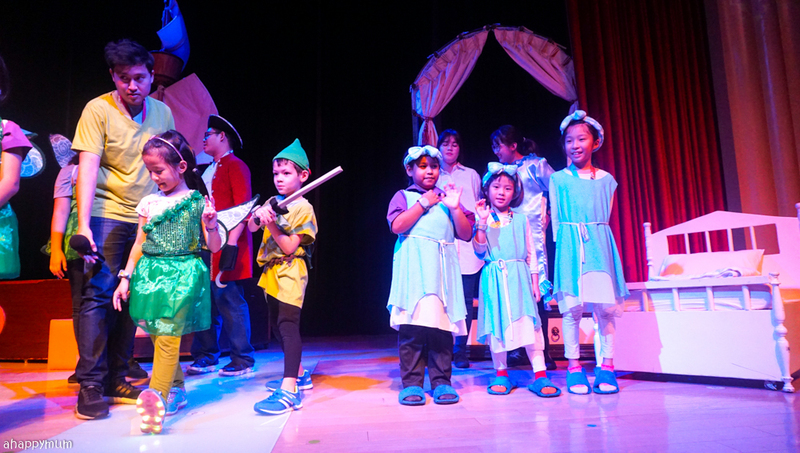 Our show for the day was Peter Pan and both of the girls picked the role of Wendy so they took turns to act it out on stage. I could sense their nerves yet I knew it was such a great learning experience for them too. Kudos for not giving up and for overcoming your fears, my dears! 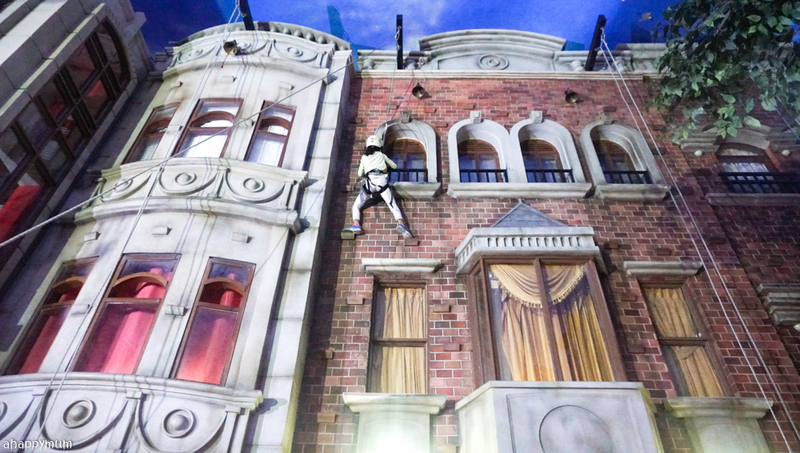 It was the Angel's first time scaling up the building in KidZania and you have to be over 120cm to be allowed to do this. So while she climbed to the top in her helmet and safety harness, the little sister cheered with her heart as she awaits for the day she is tall enough to do it too. Haha. It was quite amazing to see how swiftly the big girl could reach the top and ring the bell and she was proud that she accomplished it too. 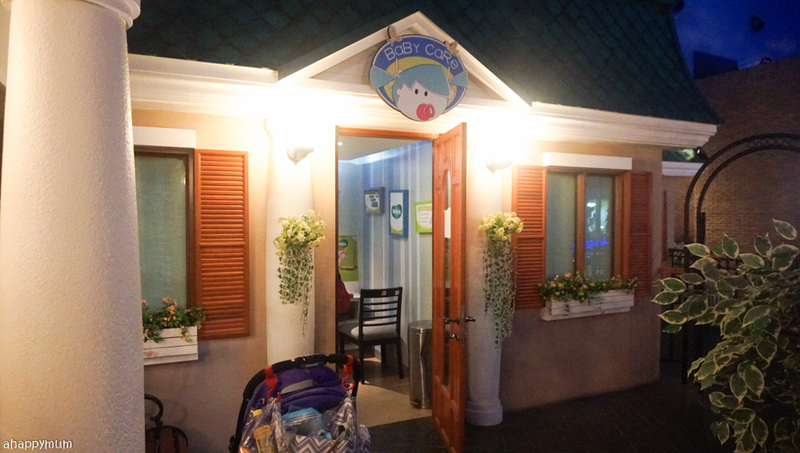 This was one of my favourites because it was a toddler-friendly one! Yes, I got all excited every time I saw a sign that said 'suitable for kids aged 2+ years' (look out for the one with a young kid against a red background) because it meant that Asher could try it out too! He looked so cute in the oversized helmet and vest and couldn't wait to start laying out the bricks. It was such a simple activity but he had so much fun throughout that 15-minute session. That look of pure joy and pride when he received his first salary, well, that was priceless. This was yet another activity that welcomes toddlers! 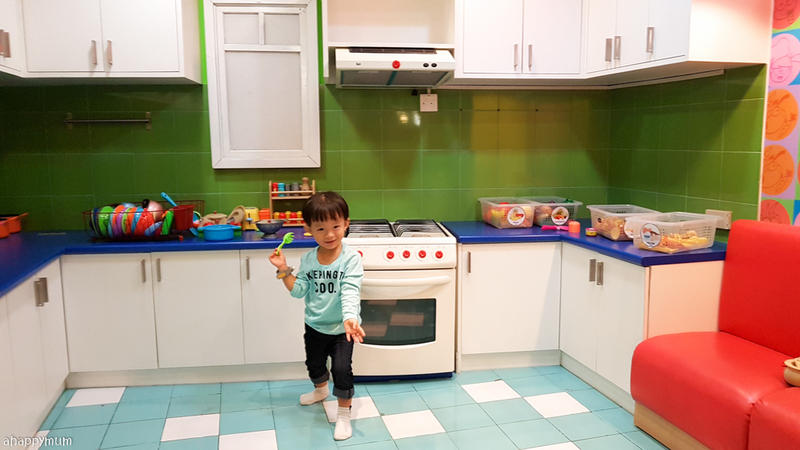 The boy made a new friend here who was the same height as him and together, they became interior designers who re-arranged the furniture inside a doll's house. We were told that older kids would do it inside a room setting but this was more than enough to entertain the two-year-olds and keep them entertained for a while. They even had their photo published inside a design brochure which was really cute to see. This was something totally new to us and the kids were excited to work at the water research centre where they had to go investigate water pipes underground armed with a helmet light. Each of them could also take home a bottle of Chang mineral water as a reward of their efforts. 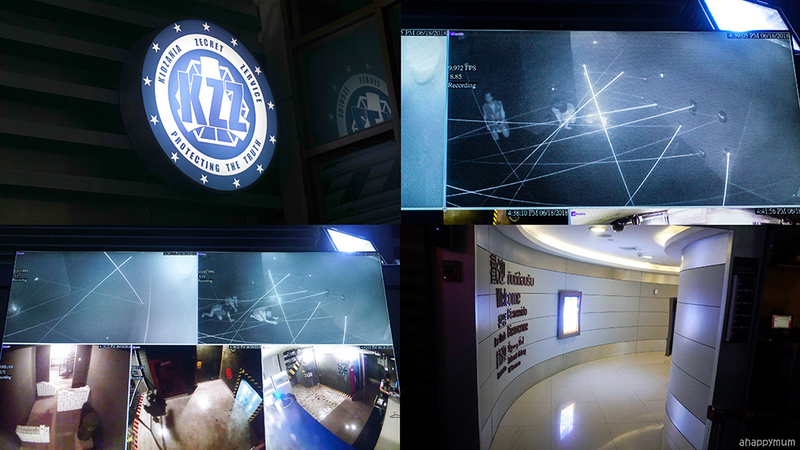 What amazed and delighted me was to know that many of the establishments in KidZania Bangkok, especially those which are obscured, had CCTVs installed so that parents were able to watch the activities even from the outside. How superb is that, right? I was able to make out what the kids were doing at every point which enabled me to better understand the activities and make conversation with them afterwards. 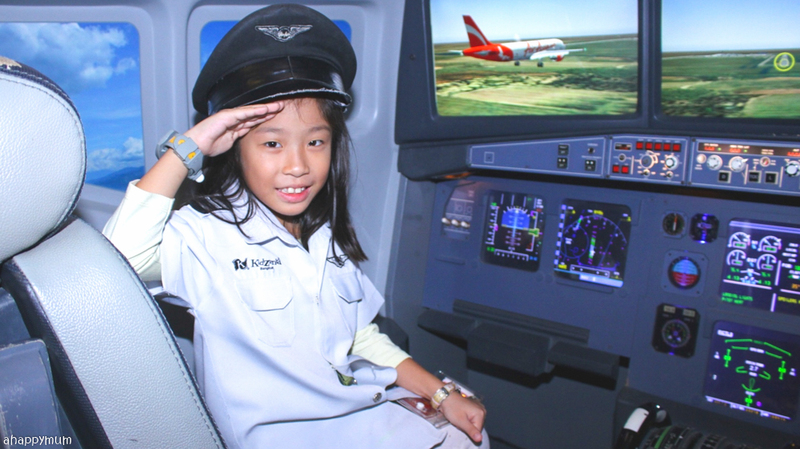 This is something similar to ours in Singapore whereby kids get to play the roles of pilots and cabin crew. 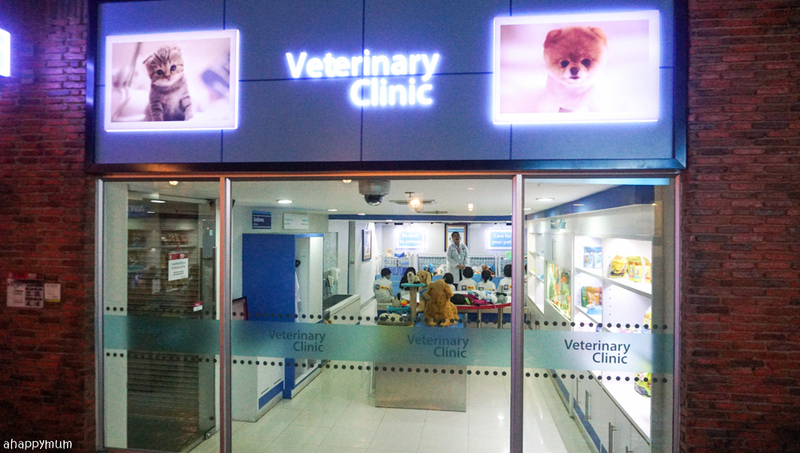 Not surprisingly, it's also one of the most popular activities here in Bangkok so do try to hop by when you see that the queue is not that overwhelming. They don't give out time tags so you do have to join the queue in order to play. 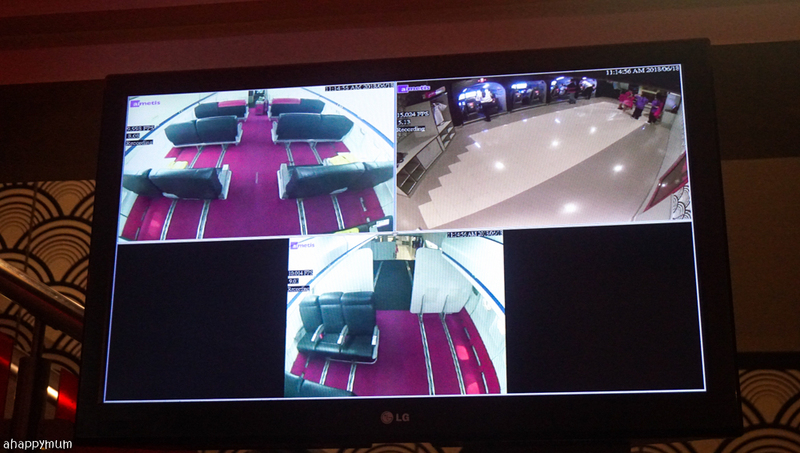 Once again, parents will be able to witness the whole activity on the screens, even though the kids' faces might be a little blurry or that you probably can't make out the aircraft dashboard. I have to say that this station provides one of the best photo opportunities in the park so if you are planning to purchase any photo package at the end of your visit, don't miss out on this one. 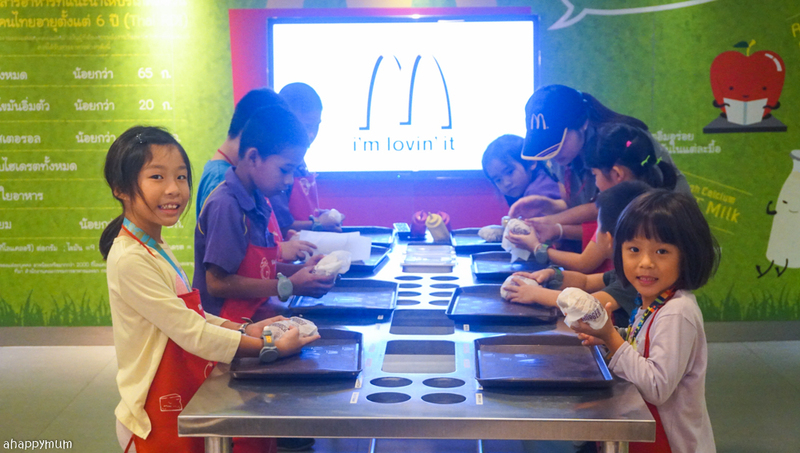 While we have KFC in KidZania Singapore, KidZania Bangkok has.... McDonald's! 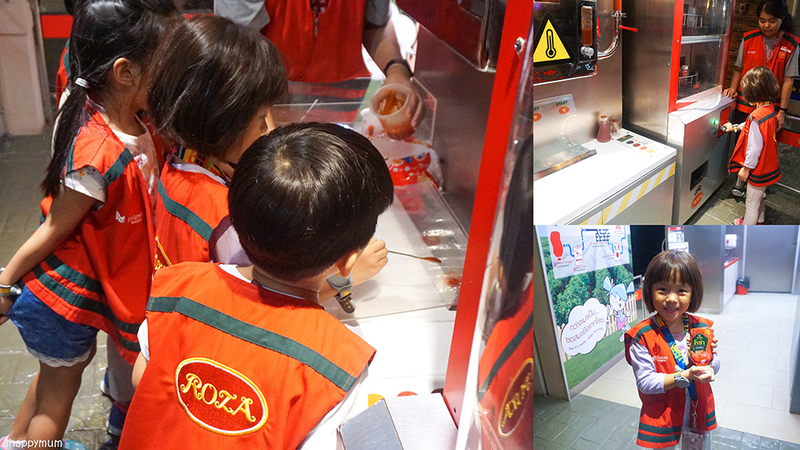 Making the kids do this activity when it's nearing lunch time and letting them be able to devour their own creations is one of the best KidZania tips one can give you. This is especially so if the cafeteria is crowded or if you only wish to grab a quick bite before continuing with the activities. The girls made their own burgers by choosing between pork or beef patty and the ingredients (lettuce/onion/pickles) they wanted. For the rest of us, we bought our food from the McDonald's counter (which serves the normal McDonalds' food) and tucked in while they were waiting for their turn to play. By the way, in order to be fair, kids are not allowed to have adults queuing up for them so you will not be able to chope or reserve a slot for your child okay. 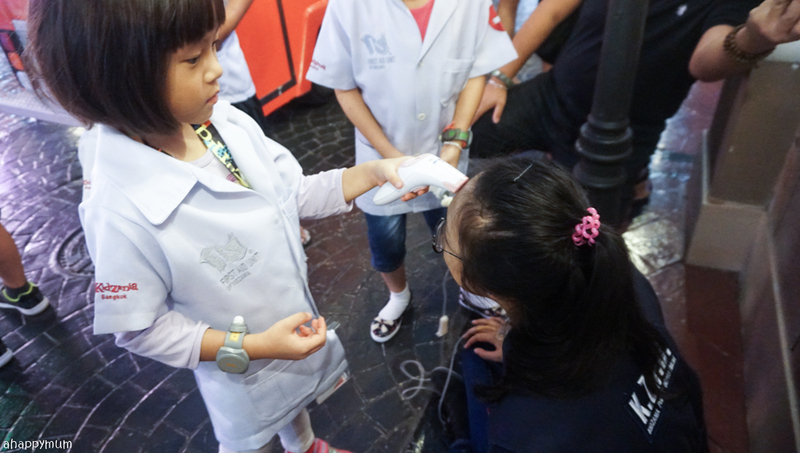 Ariel aspires to become a doctor so the hospital is an establishment we can never miss out on when we go to KidZania. This time, she became a paramedic and went around the ambulance saving lives in the city. The one feedback I have about this station is that the photo taking took ages, likely longer than the activity itself. 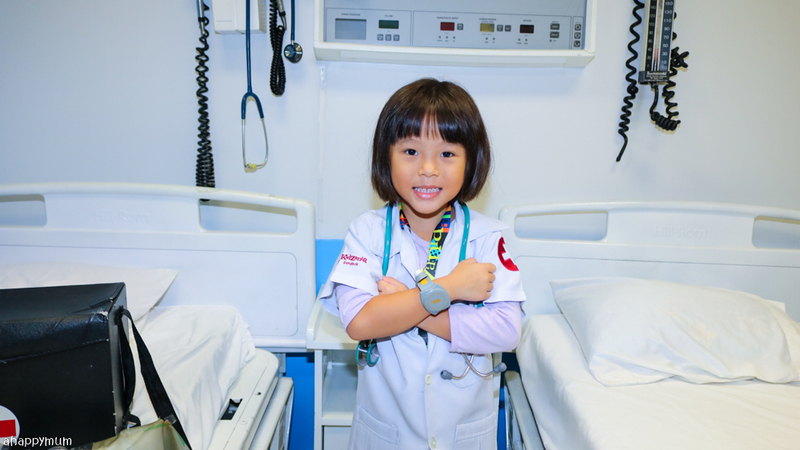 Well, of course I love that they get individual shots of themselves in the cute uniforms and doctor's gear but it did take quite a while for the photographer to capture shots for every kid. 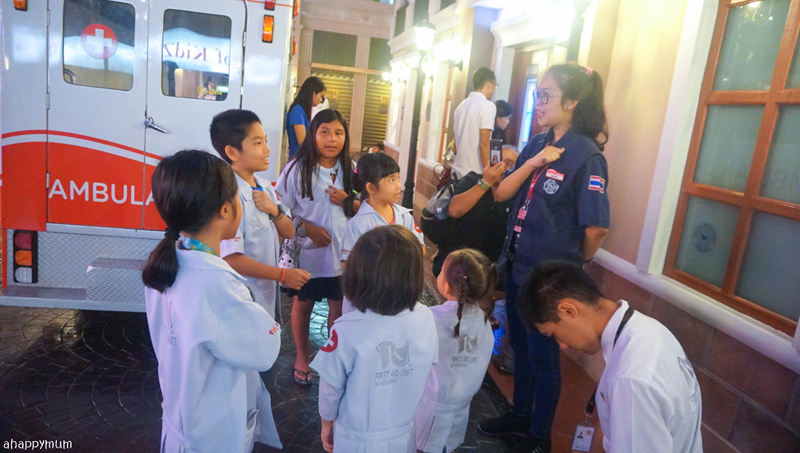 The girls were quite shocked to find someone unconscious on the streets but soon realised that it was one of the KidZania staff. They discharged their duties well - each kid was in charge of a different medical equipment - and together, they helped to save the person. 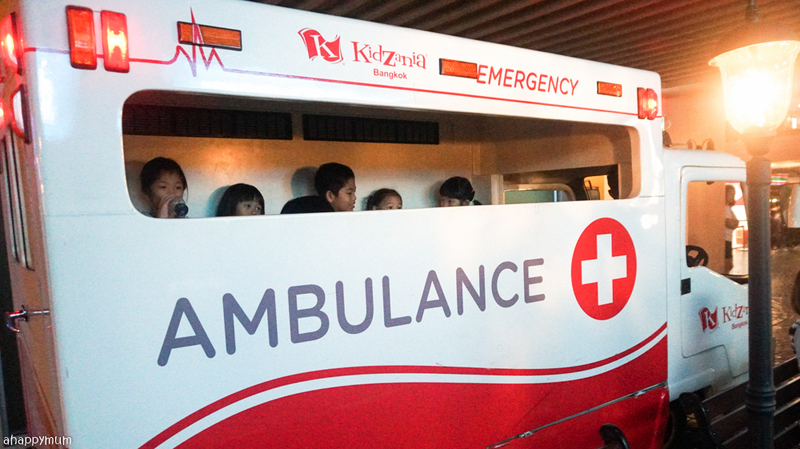 I have to say the most exciting part of it was to be able to ride in the ambulance which sounded a totally loud siren! 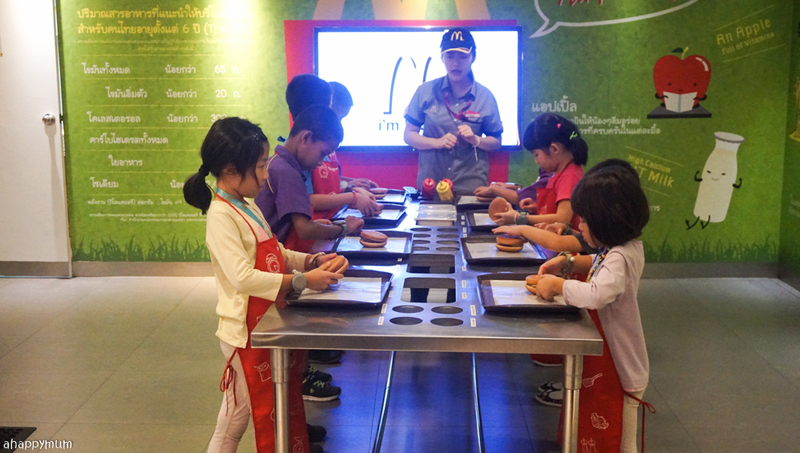 This was something different for the kids as they learnt about how ketchup is created from scratch, how to create the most ideal viscosity, and they ended the experience by taking turns to push a lever to make their first ketchup bottle - which could be brought home. 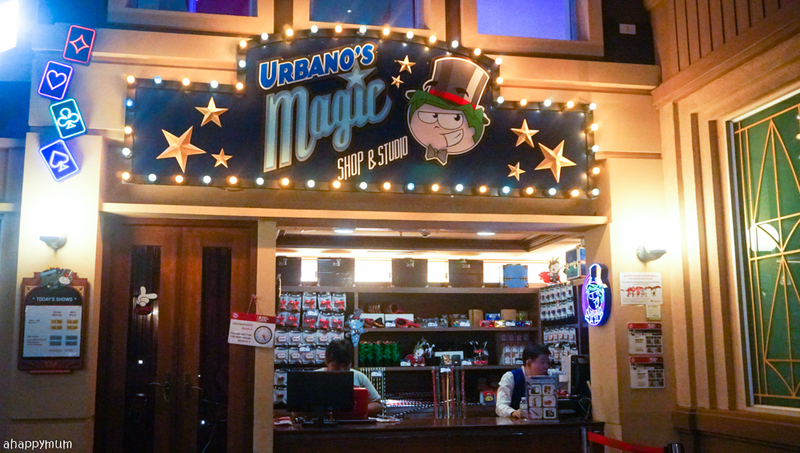 The girls have always been fascinated by magic and were thrilled to find the magic studio in KidZania Bangkok. Not only were there many interesting props on display, the staff would also demonstrate some simple tricks to them. The kids also managed to take up their first magic lesson but alas there was no CCTV for this so I was unable to actually see what they did inside the room. 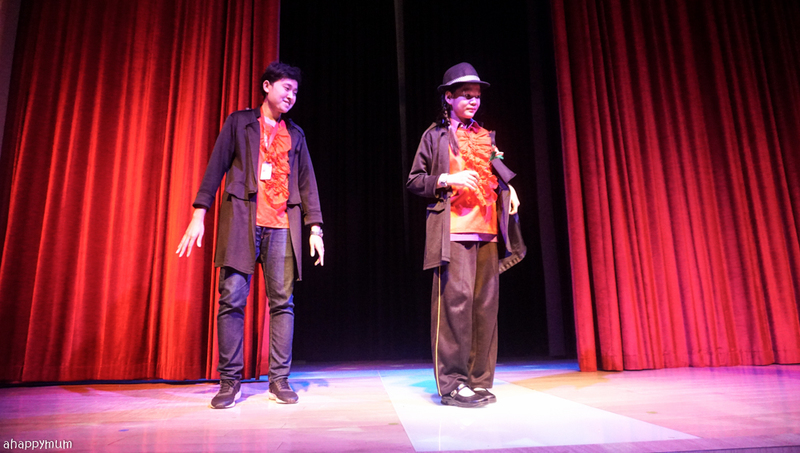 If timing permits, kids can even train to become magicians and perform on stage in front of a live audience. That would be so awesome! Hands up, who are fans of Meiji Milk too? 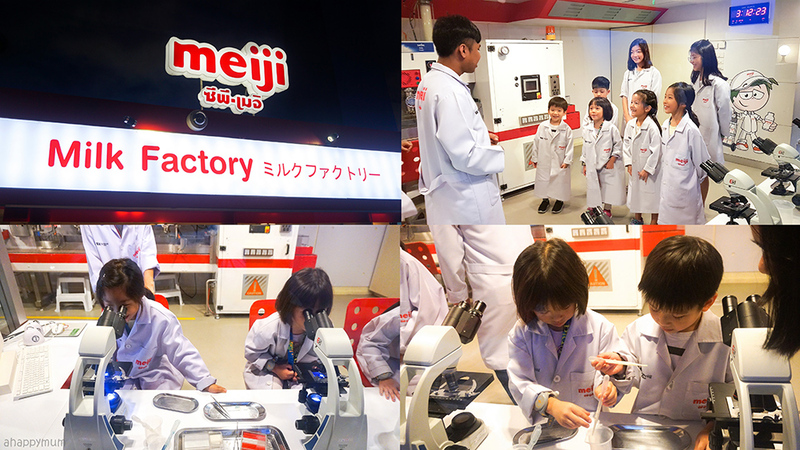 My kids drink so much milk and it was nice to finally set foot in a Meiji Milk Factory! They were able to learn about milk production, make use of real microscopes and choose their favourite flavour of milk to bring home too. The door to the Secret Agent establishment is a little tucked away (why am I not surprised?) so it might be easily overlooked if you don't see close enough. I was the one who spotted it and was so amazed to see kids playing in the laser maze from the screens outside that I knew I had to let mine try it out. 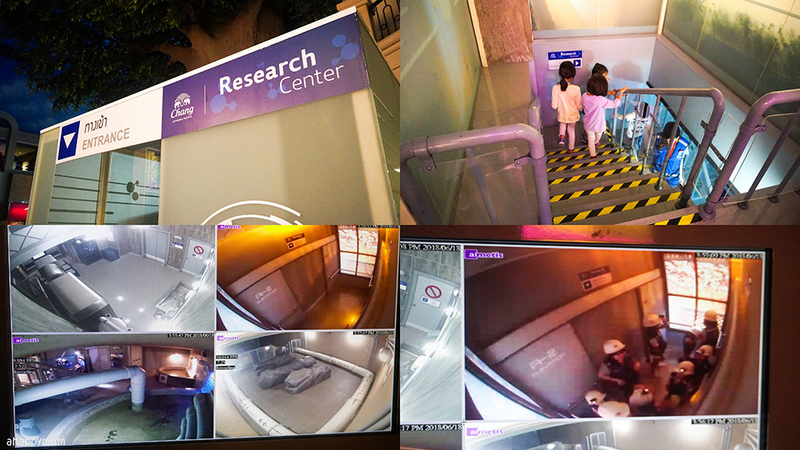 Yup, it turned out to be one of their favourites as they pretended to be spies who had to crawl across the rooms in order to avoid surveillance cameras and then climb through the laser maze too. Fun! 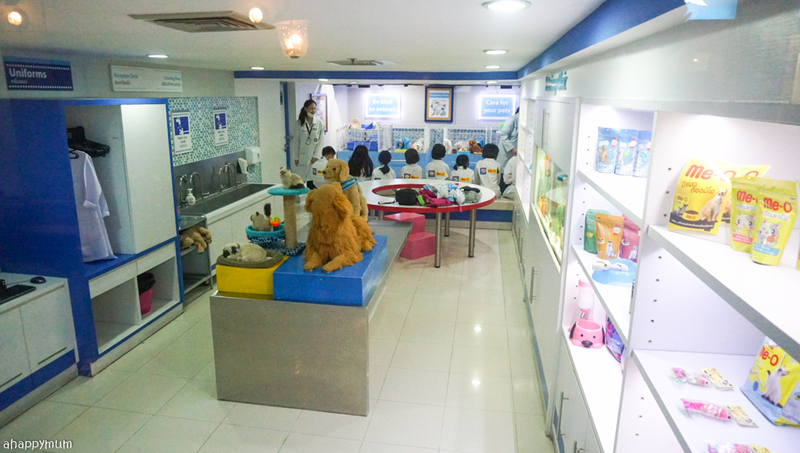 Being animal lovers, the girls were excited to see that there was a veterinary clinic in KidZania Bangkok! 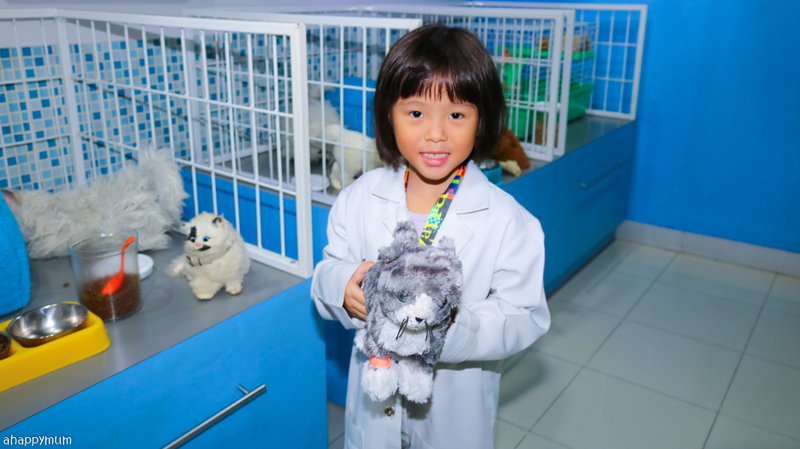 Yup, even though the pets were really stuffed toys, it was fun for them to pretend to be vets who cuddled the sick animals, treated them and helped to make them well again. It was quite an achievement that we covered over a dozen activities within a day but seriously, there were so many others we would have liked to try out if we had more time! Well, I guess that just gives us a reason to want to come back again soon, right? Among those activities that caught our interest include the Court House where kids can pretend to be judges and attorneys, the Safety Driving School where you have to obtain your driving license before you can become a driver at the Gas Station, the Green Tea and Coca-Cola Factory, the Peanut Factory, the Disco Lounge and of course, the popular Firefighter which we had to sadly miss because of the long queue! 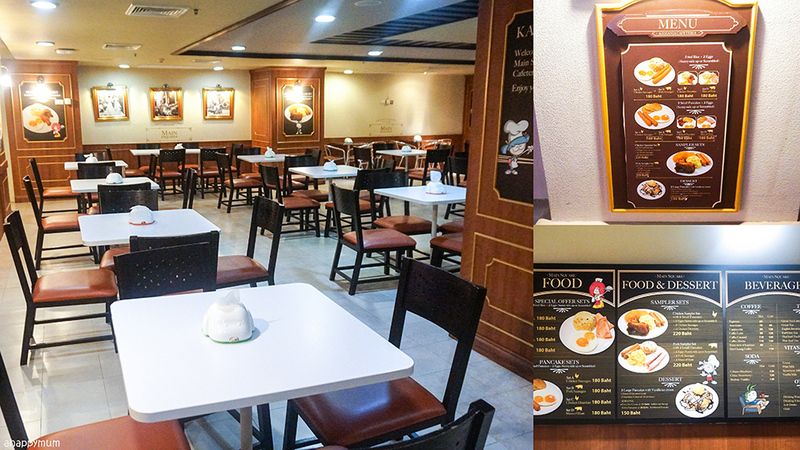 There is a Cafeteria located near the Theatre in the City Square and you can find a small variety of food, snacks and beverage - including pancakes, sausages, ham, fried rice and chicken drumlets. There is also an Oishi Japanese Restaurant which serves sushi and Japanese food. Or, you can always go to McDonalds and tuck into some fast food too. For the parents who have the luxury of relaxing while their kids run off to play independently (I will get there someday, no hurry though), there is a special lounge just for parents ONLY! Yes, no kids are allowed here so it will be like a peaceful oasis where you can rest, relax, watch TV, read or just use the internet and chill out while you wait. 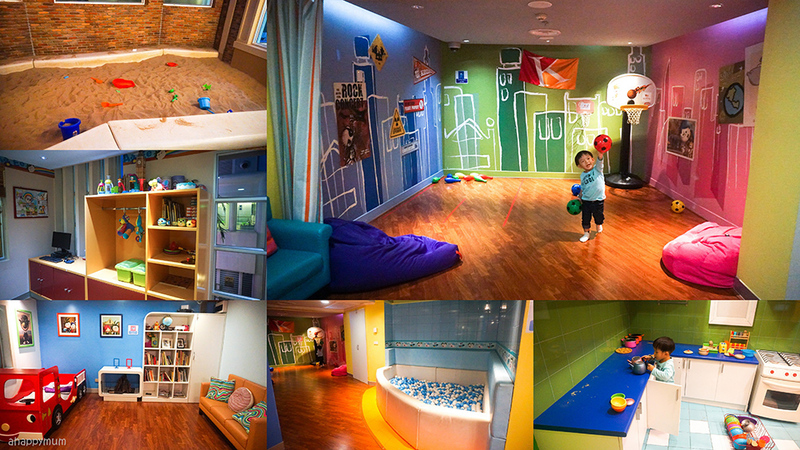 If you have younger children, rest assured that there will be something for them to keep them busy and happy too. 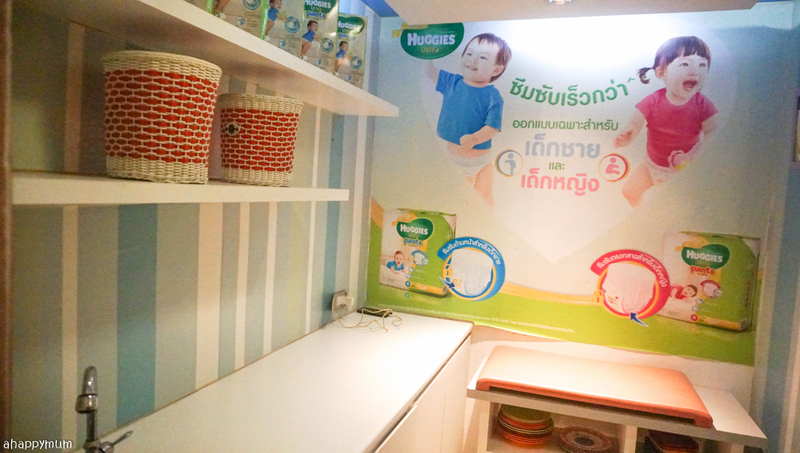 On Level 2, which can be accessed with the elevator if you need, there is a Baby Care room where you can find a comfortable changing station. 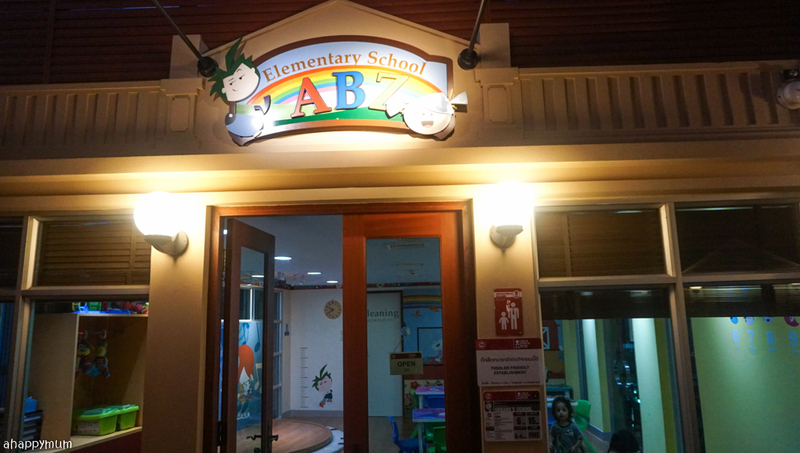 Elementary School ABZ is where you can let the toddlers run around, be free to explore the different rooms and make use of creativity to play too. 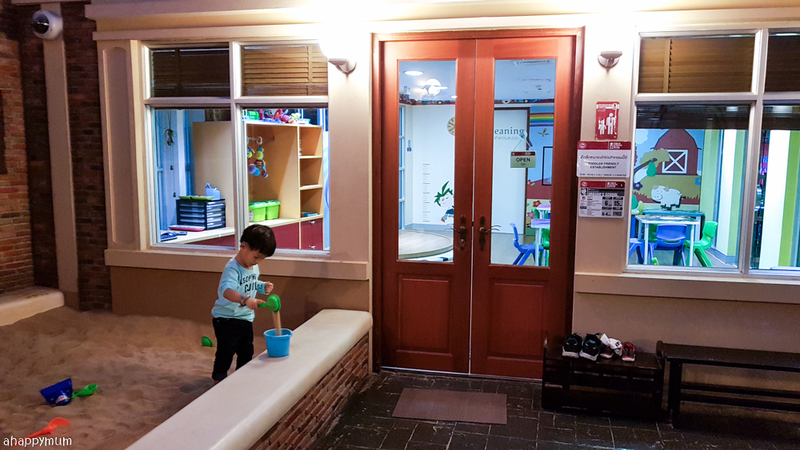 Things that you can find here include a sandpit outside the school, a basketball corner with a standing hoop, a reading corner complete with a bed and sofa, a huge ball pit, a stage for them to perform, a well equipped kitchen as well as toddler-friendly toys for them to play with too. 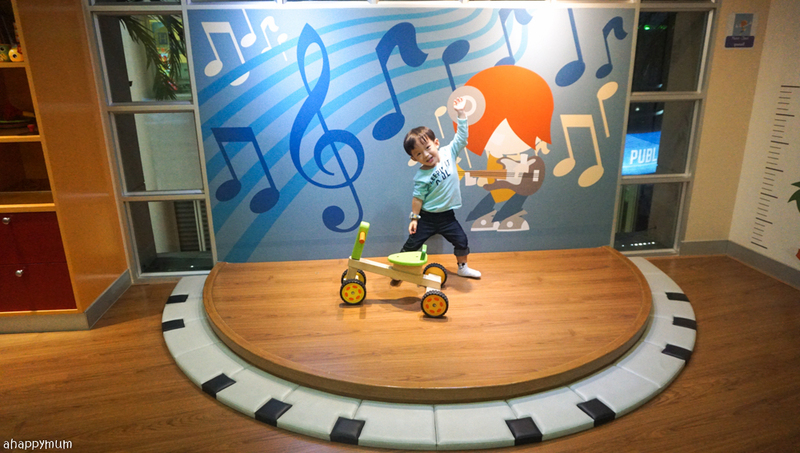 When Asher was not playing at the establishments, he was just happy to hang out here and make friends with other kids of his age. 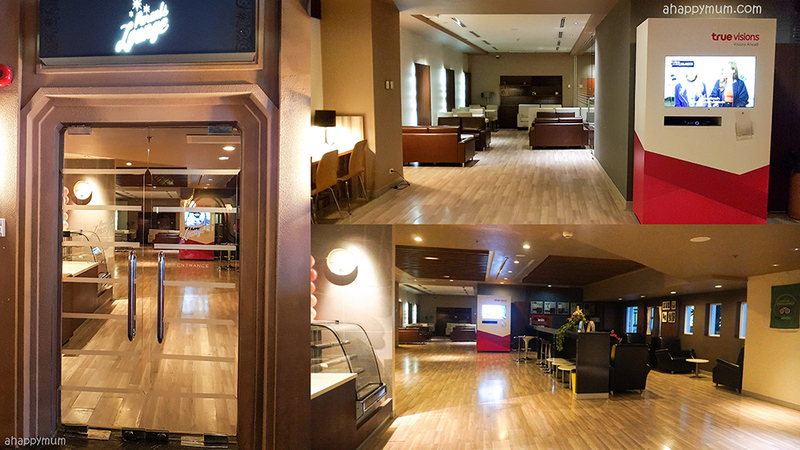 I loved that it gave us a little more peace and privacy, away from all the bustling activities outside too. It was such a fun day for the kids and as usual, we were one of the last ones to leave the place. I couldn't resist getting a photo package too because those shots were so priceless! 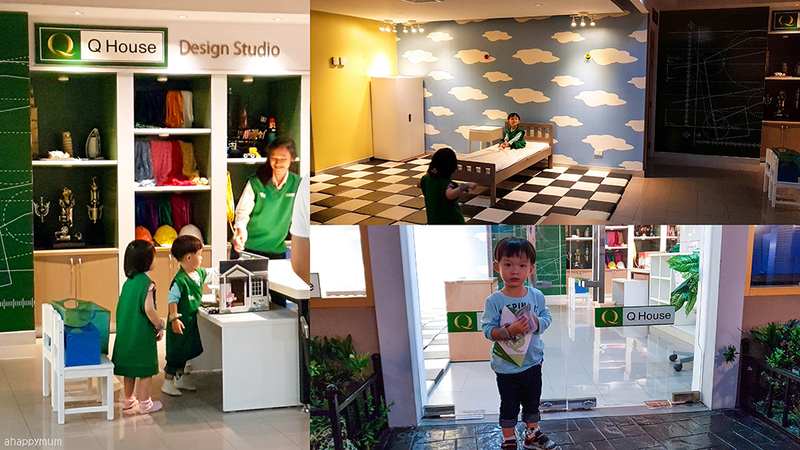 Despite how some critics might say that it's all blatant advertising with all the branding, KidZania means something very simple for my kids - it is a city where dreams can come true for them. 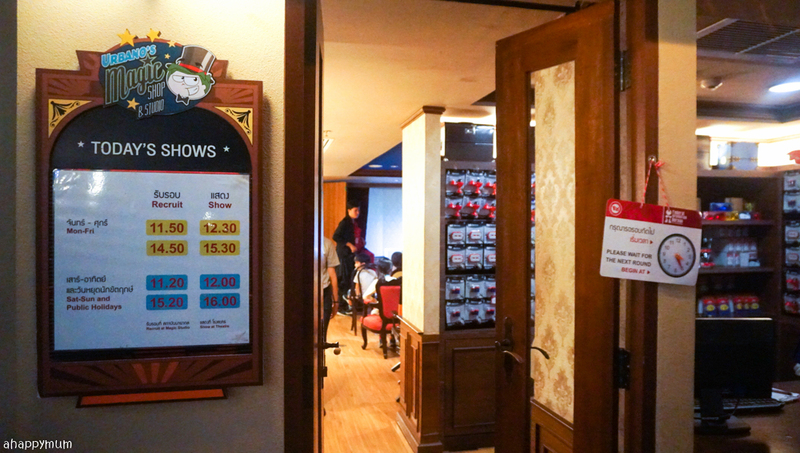 Before I forget, if you have your KidZania passport, do bring it along because although they will not be able to give you the individual stamps at the activities, you can show the passport to the staff just before you exit and they will issue you a sticker that says KidZania Bangkok so that you have one more city covered. I hope this post gives you an insight about what you can look forward to when you decide to visit! I know we will definitely be back again someday! To read about our Bangkok trip itinerary, visit my previous post here. 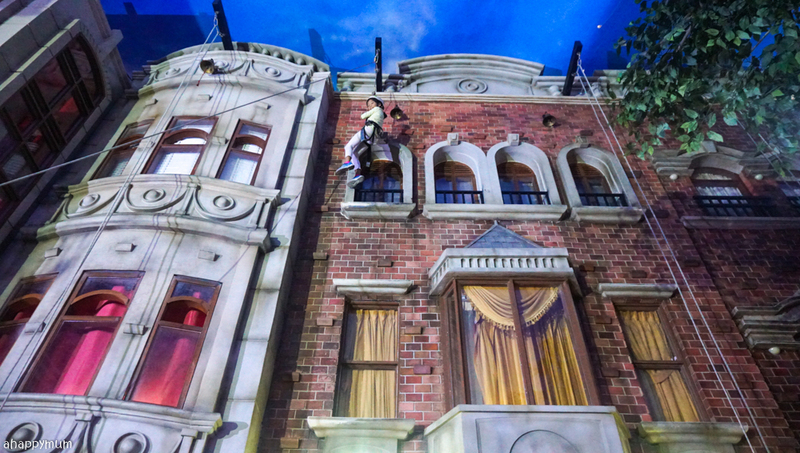 You can also click on the below where I share more about each individual attraction we visited. 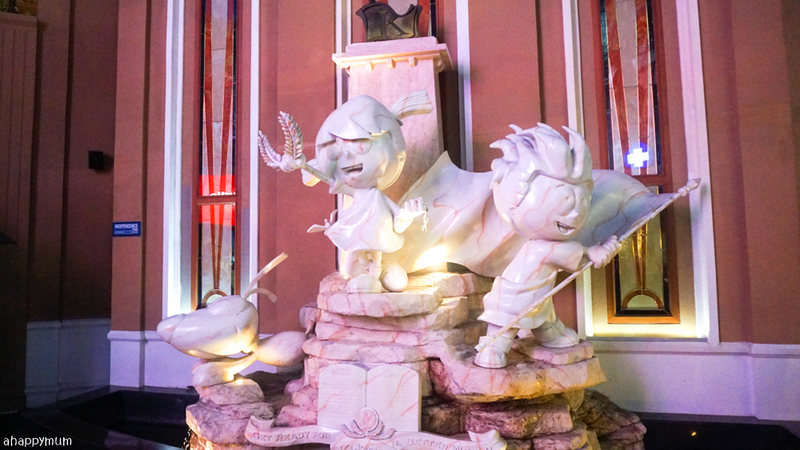 Have fun at your next visit to this family-friendly and fun-filled city! 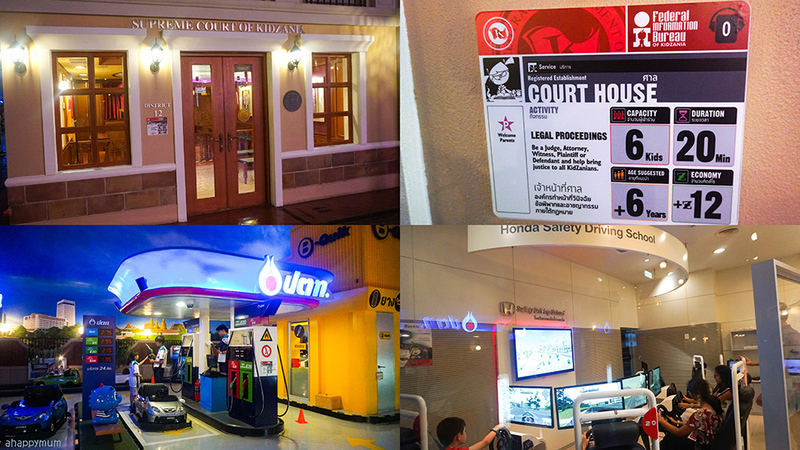 Disclosure: We were hosted by KidZania for a media visit during our trip to Bangkok. All photos and opinions are our own.